Who said law students can’t be athletic? Check out the various athletic opportunities at the law school, as well as the ALSS website to see the sports teams available at Allard. Don’t see your sport? No problem. You can always create a new team! Contact the director of sports and clubs at clubs@ubclss.com. 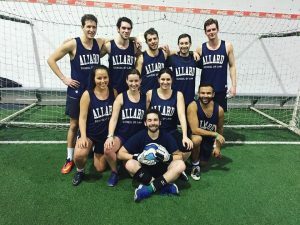 Check out posts on Intramurals at Allard, the Legal Eagles Hockey team , Women’s Rugby, and Men’s Rugby.